As I was walking back to the banding station after opening my half of the mistnets at our MAPS visit Tuesday morning, I crossed some juniper habitat that we don’t usually pass through during the course of the day. Within moments of stepping onto the granite rise I had two very upset, very vocal Field Sparrows circling around me, moving from ground to tree to shrub. They were giving harsh alarm chips, their mouths full of caterpillars and other bugs. I knew there had to be babies around very close by. 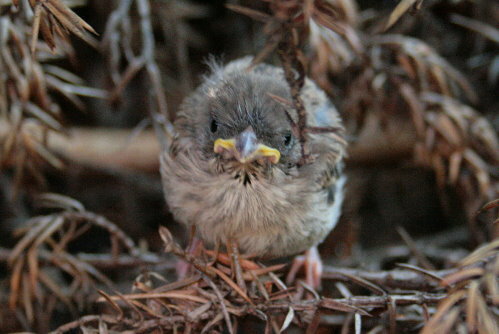 I had found a Field Sparrow nest at one of our other sites nestled into the branches of a little juniper shrub, so it was in the shrubs that I started to look first. It only required lifting a few branches before I spotted the cute little face above staring back at me. 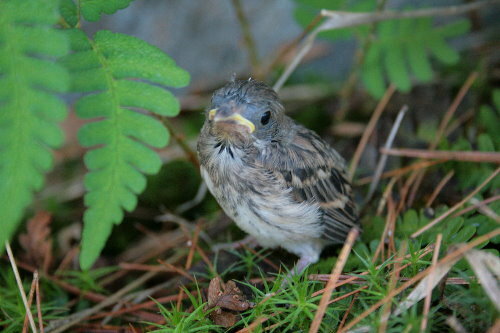 The fledgling was out of the nest, certainly, but not long. It showed no fear or attempts to escape; I could probably have reached out and picked it up if I’d chosen to. Fledgling chicks don’t show this flight behaviour until they’ve been out of the nest a couple of days; for the first little while they just sit still and hope you don’t see them. Often, it works. I finished taking a few photos of the above youngster, and then stood up to carry on back to the station. After a few metres I realized I’d left my lens cap on the ground near the chick, and turned around to go back to get it. As I was scanning the ground to see where I’d set it, I spotted a second fledgling that I’d completely missed on my first search. Surprisingly, it was sitting out in the open, beside a fern. It had been so still I hadn’t noticed it. I took a few quick photos of this second chick, collected up my lens cap, and then left so that the distraught parents could return to feeding their babies. Be still my heart!!! Those baby birds are SO adorable! Thank you for showing them to us. Too precious! I love that the second one had been so still and quiet that it went unnoticed despite being in the open. Such a smart evolutionary adaptation for babes not yet able to flee. I have also been messing with chicks recently. The young ones sure look strange. To my daughter they are ugly. Ah the certainty of youth.